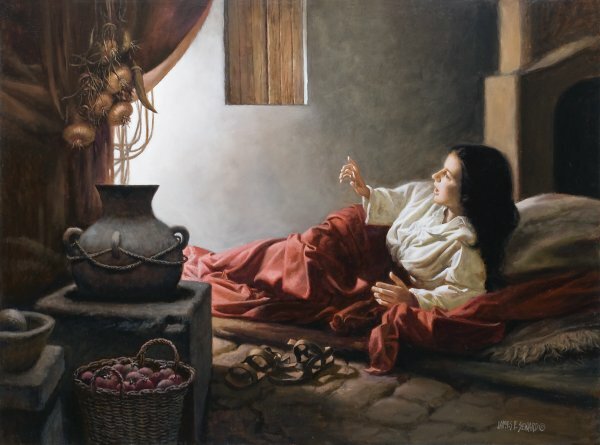 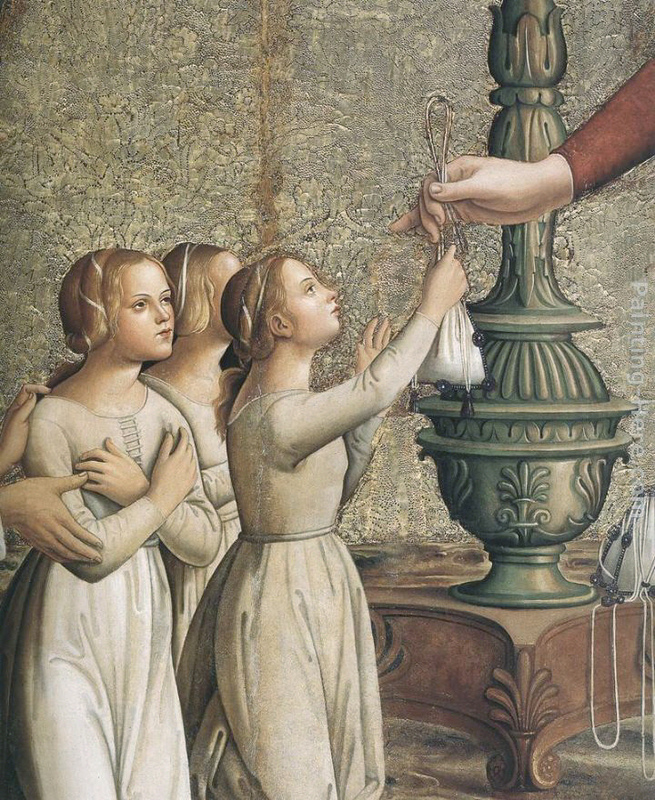 ﻿And she took a pot, and went out to draw water, and heard a voice saying unto her: "Hail thou who art full of grace, the Lord is with thee; thou art blessed among women". 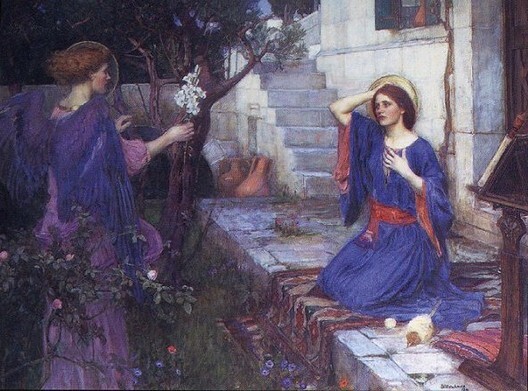 And she looked round to the right and to the left to see whence that voice came, and then trembling went into her house, and laying down the water pot, she took the purple, and sat down in her seat to work it. 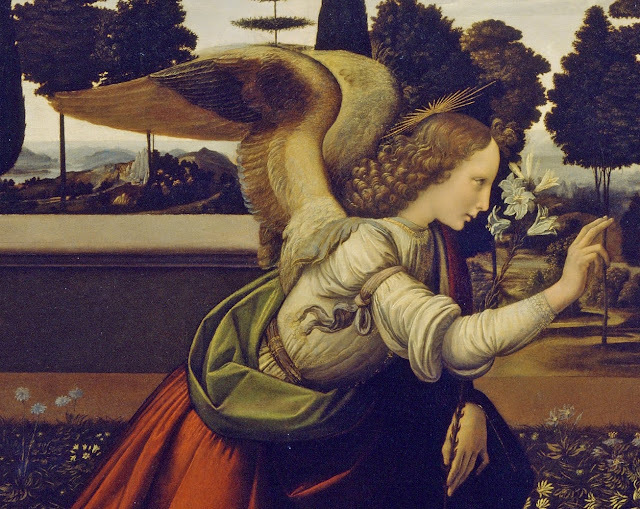 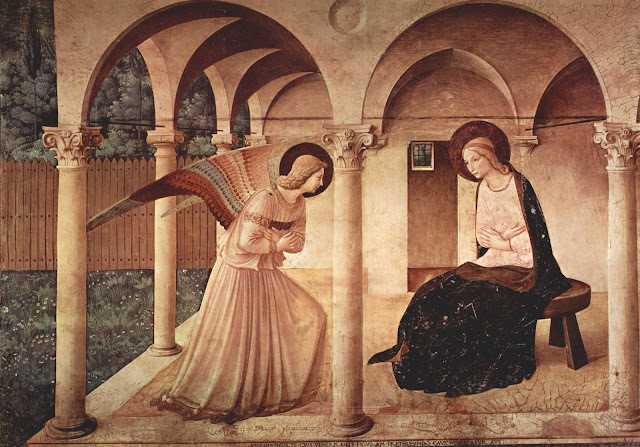 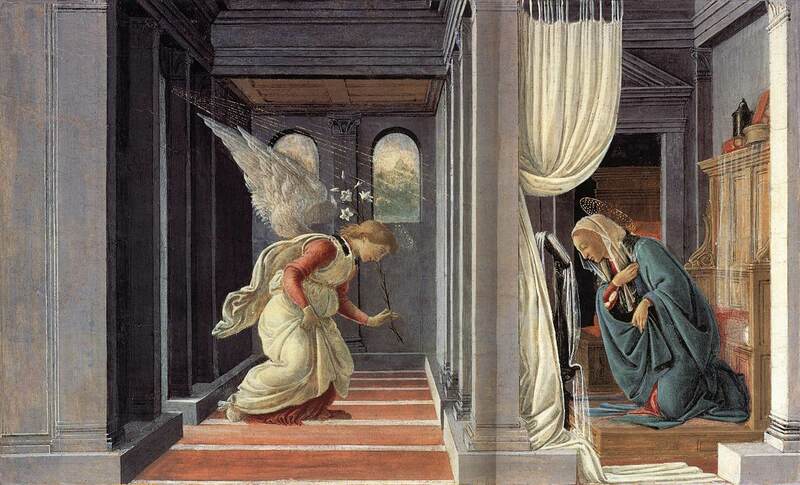 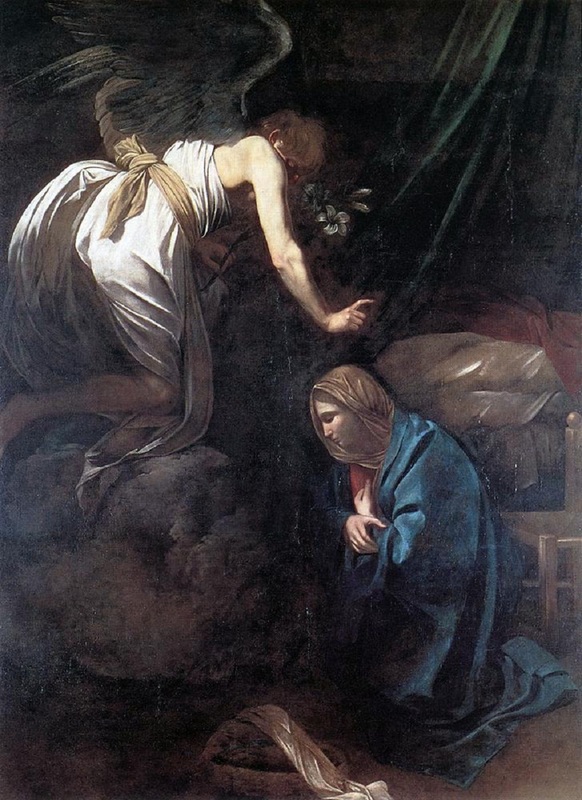 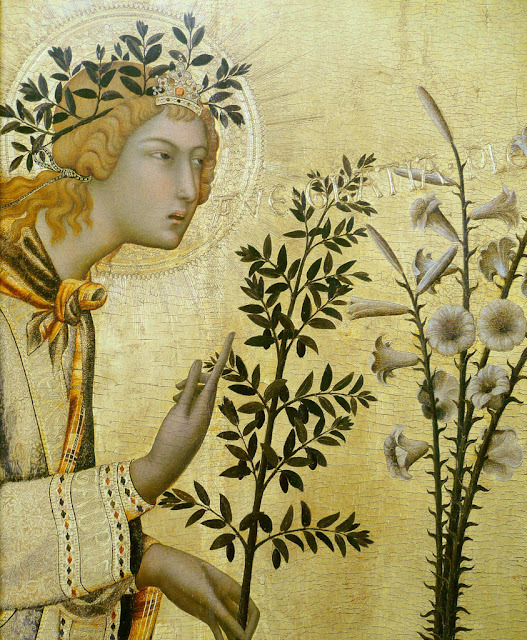 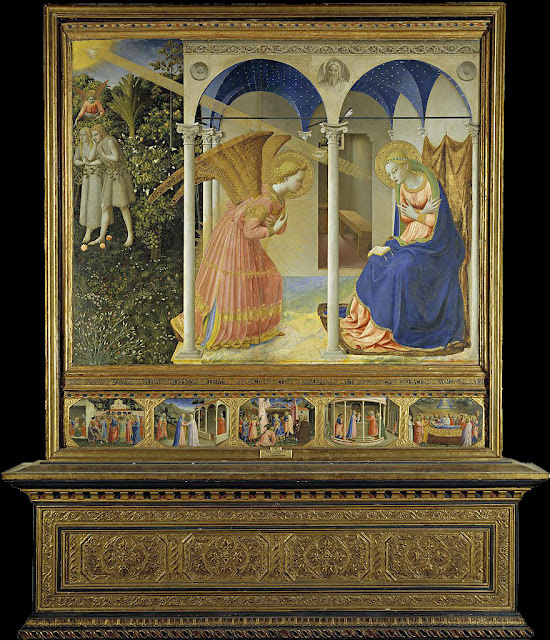 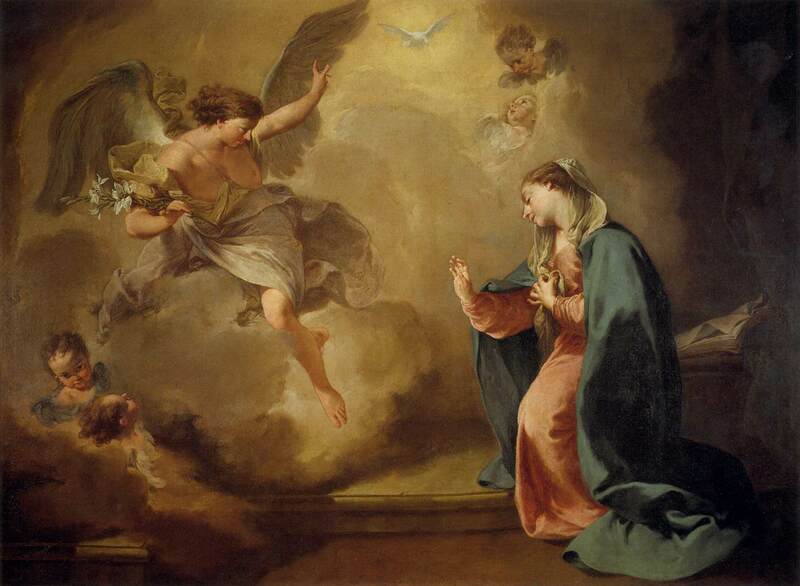 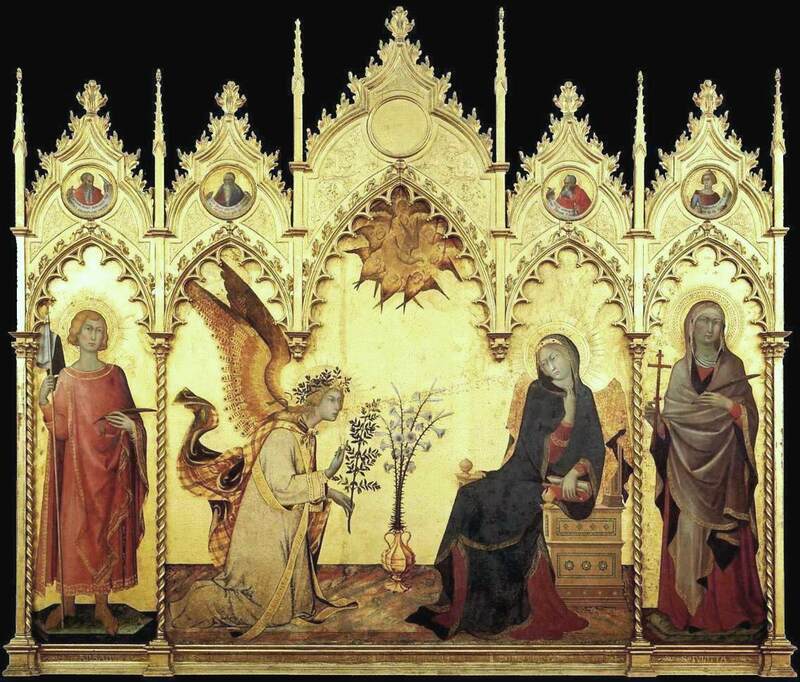 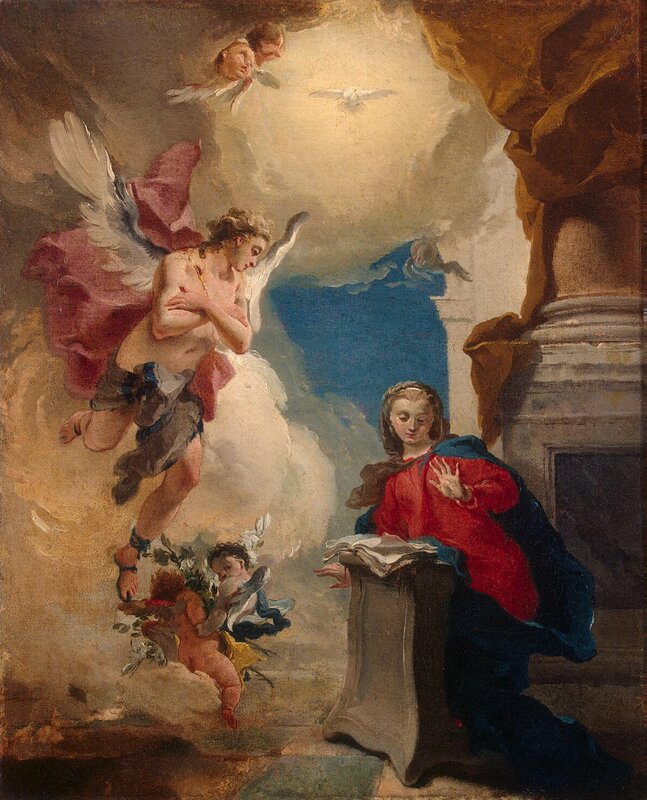 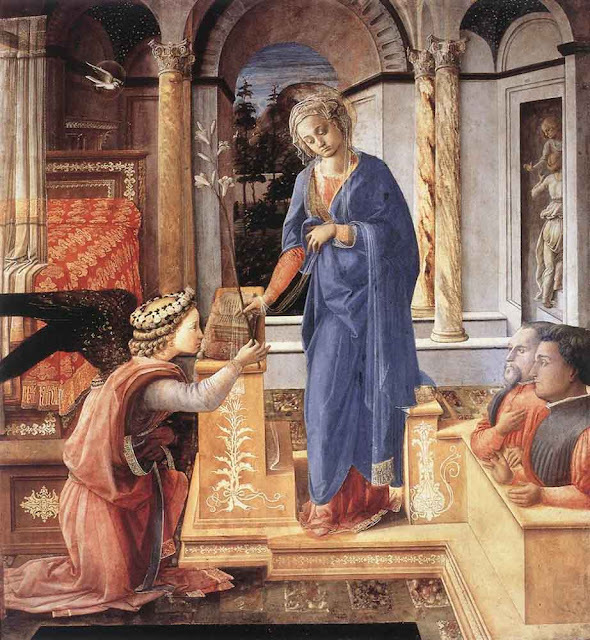 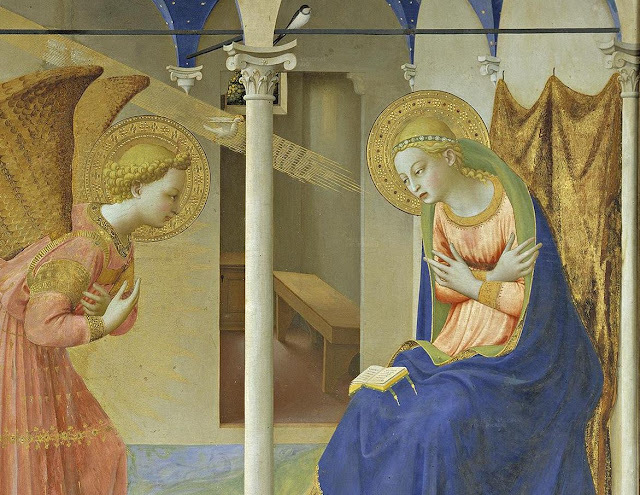 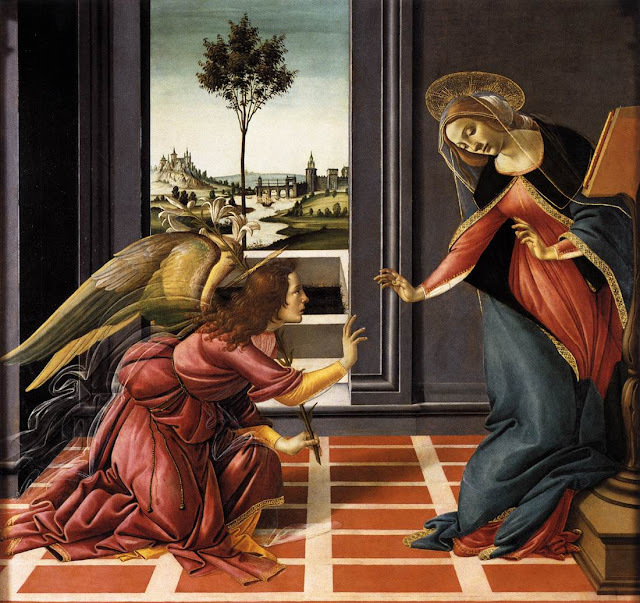 And behold the angel of the Lord stood by her, and said: "Fear not, Mary, for thou hast found favour in the sight of God".Which when she heard, she reasoned with herself what that sort of salutation meant. 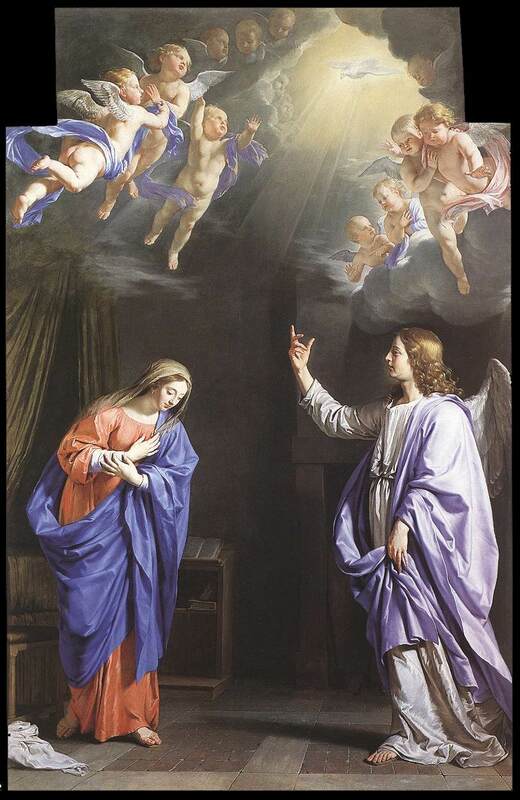 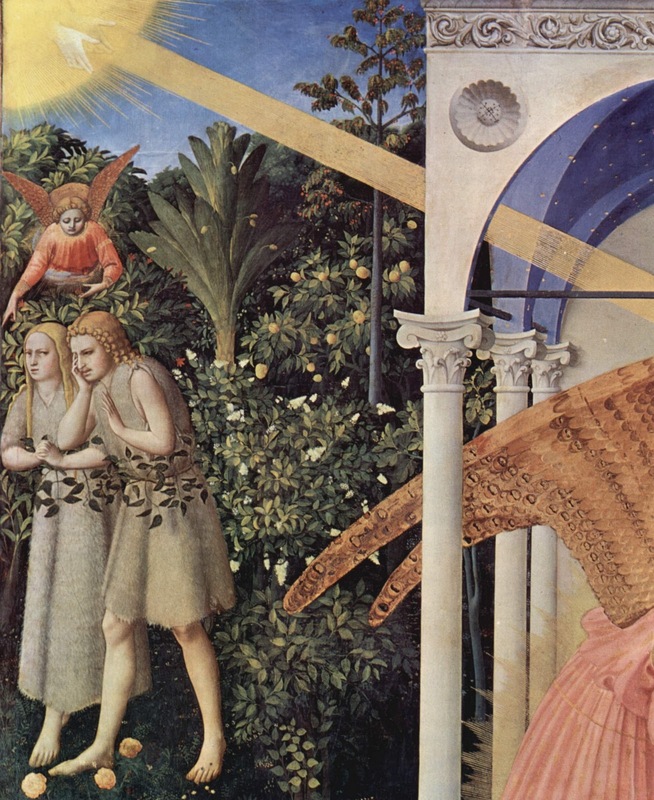 And the angel said unto her: "The Lord is with thee, and thou shalt conceive". 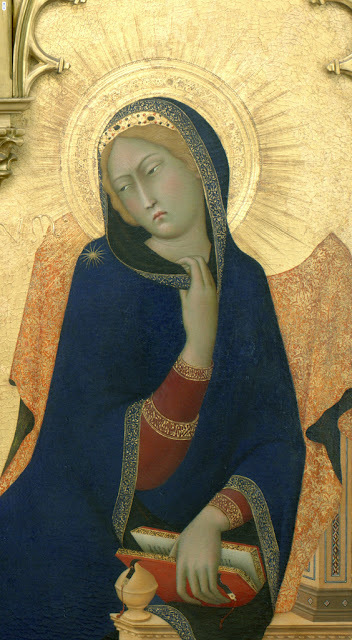 To which she replied: "What! 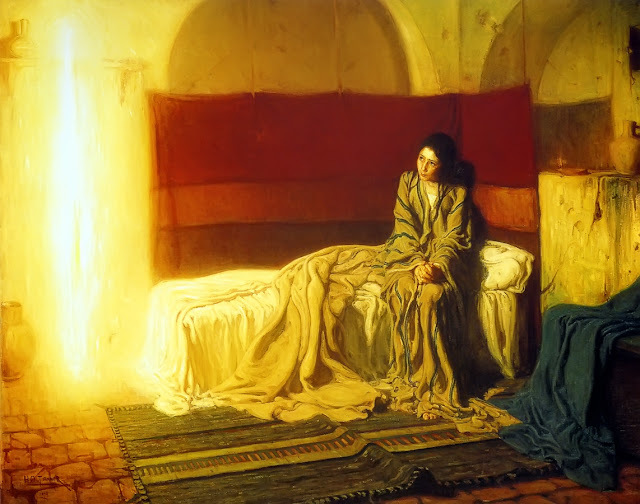 shall I conceive by the living God and bring forth as all other women do?" 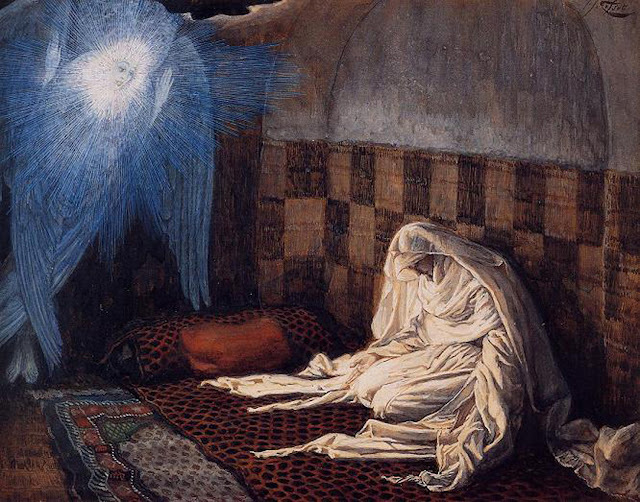 But the angel returned answer: "Not so, Mary, but the Holy Ghost shall come upon thee, and the power of the Most High shall overshadow thee; Wherefore that which shall be born of thee shall be holy, and shall be called the Son of the Living God, and thou shalt call his name Jesus; for he shall save his people from their sins. 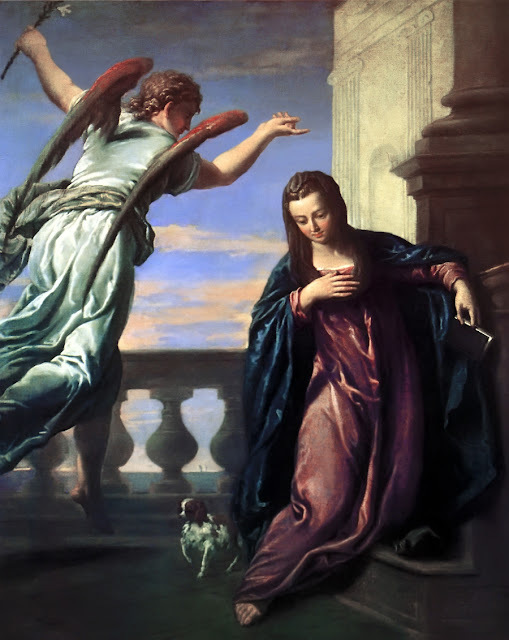 And behold thy cousin Elizabeth, she also hath conceived a son in her old age. 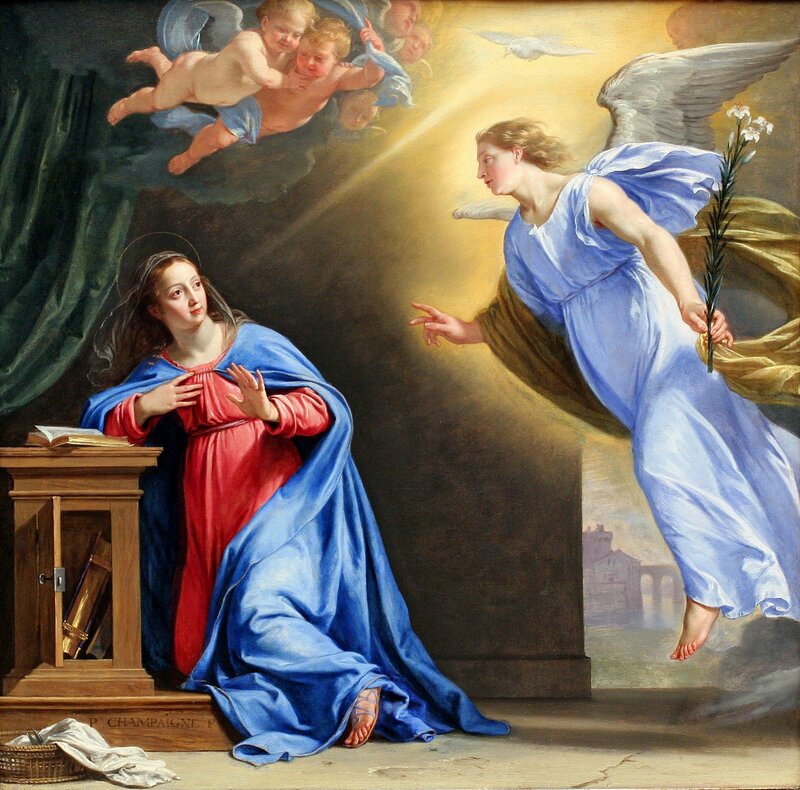 And this now is the sixth month with her, who was called barren: for nothing is impossible with God". 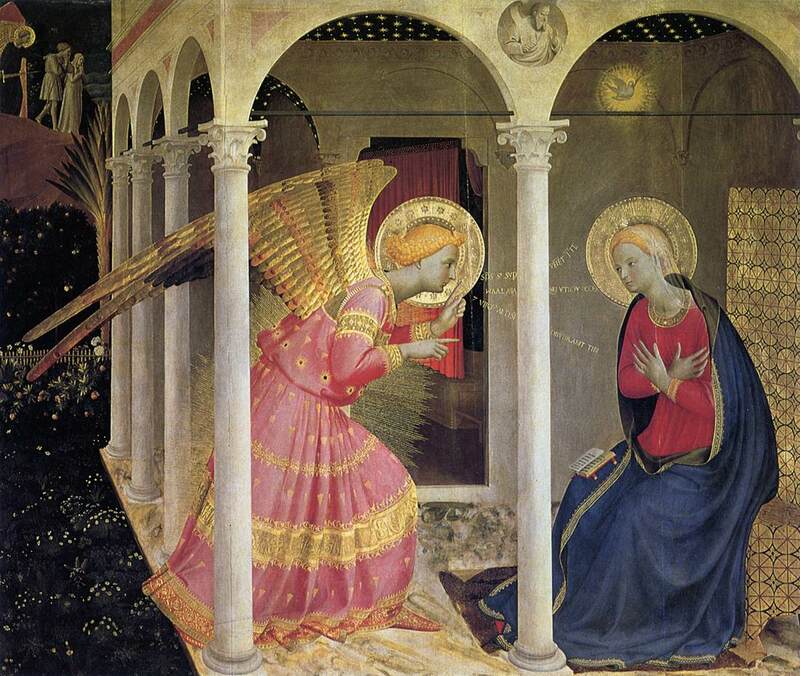 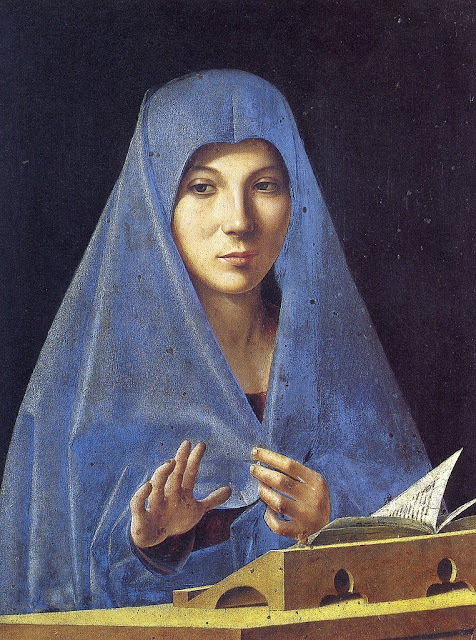 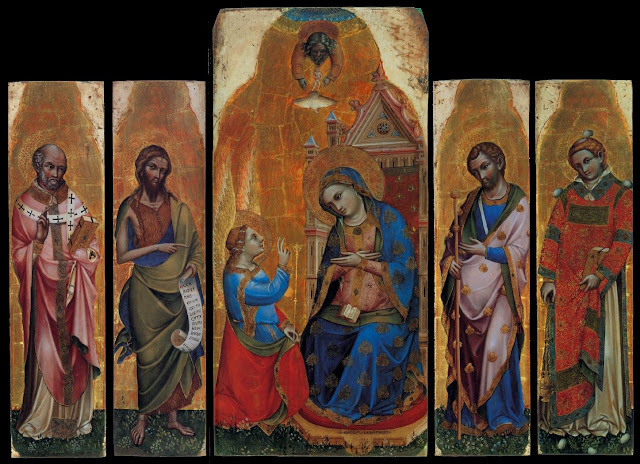 And Mary said: "Behold the handmaid of the Lord; let it be unto me according to thy word". 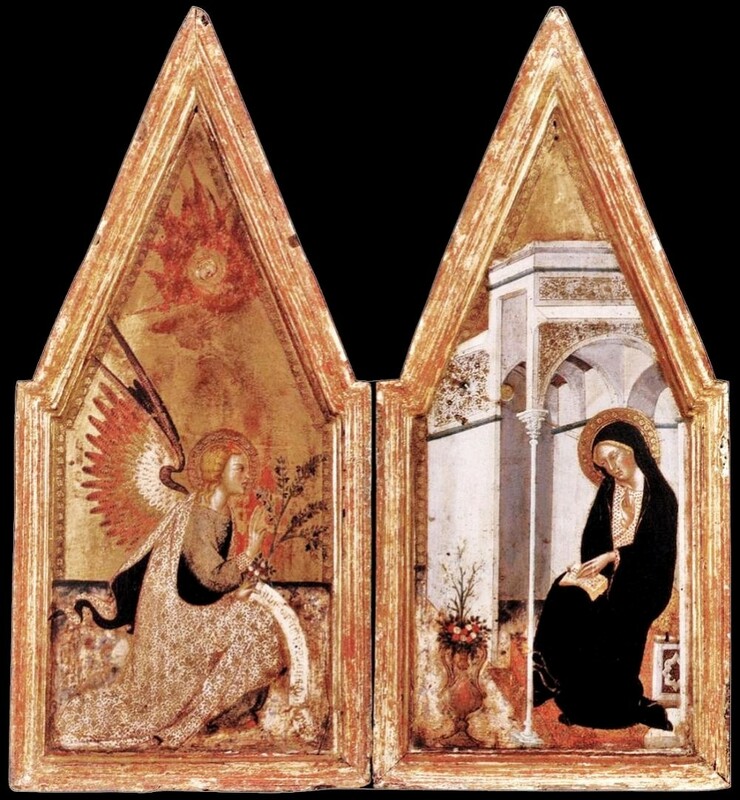 Icon of Annunciation - Church of St Climent in Ohrid - 14th. 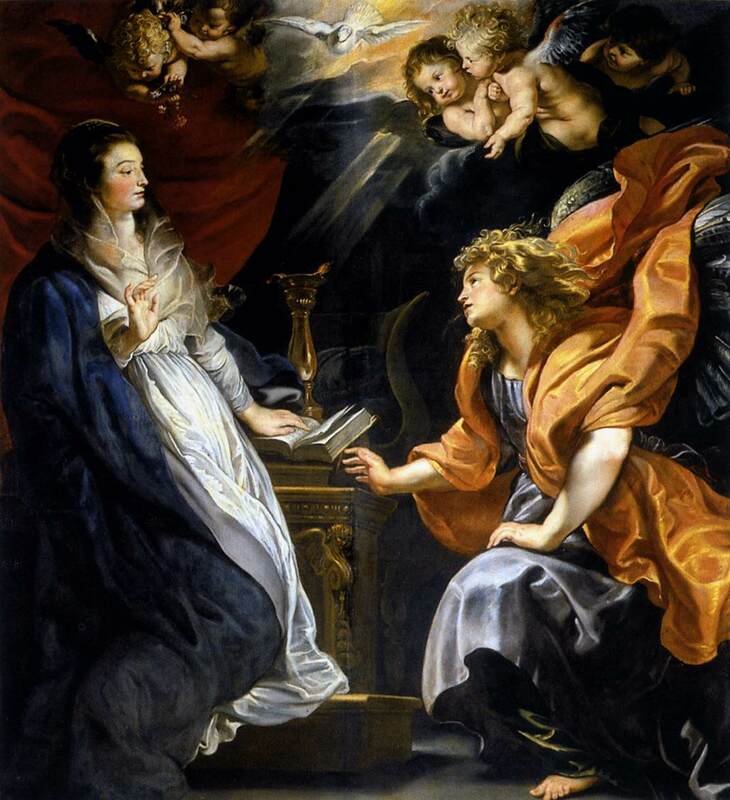 c.
O if we knew how pure she was. Y entrando el ángel en donde ella estaba, dijo: "Salve, muy favorecida! 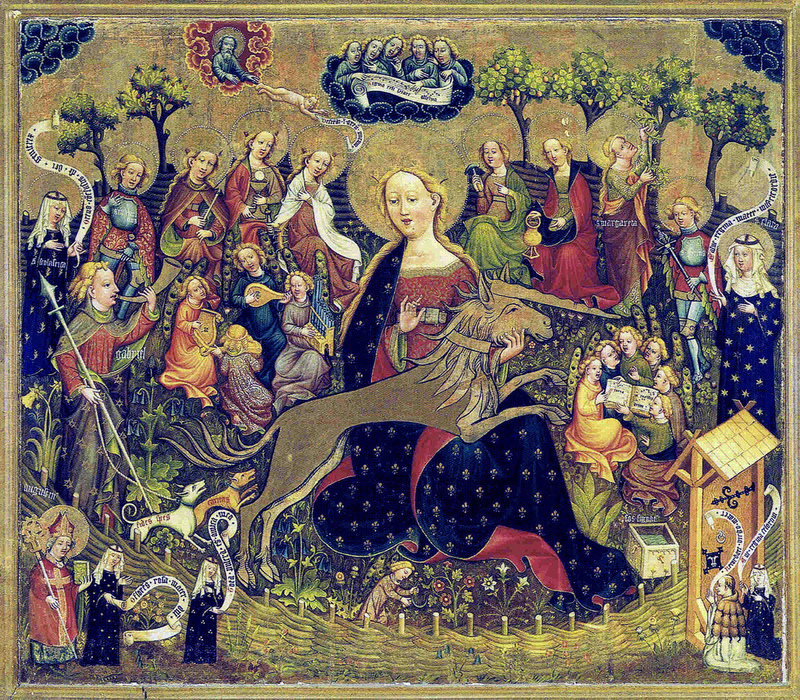 El Señor es contigo; bendita tú entre las mujeres". 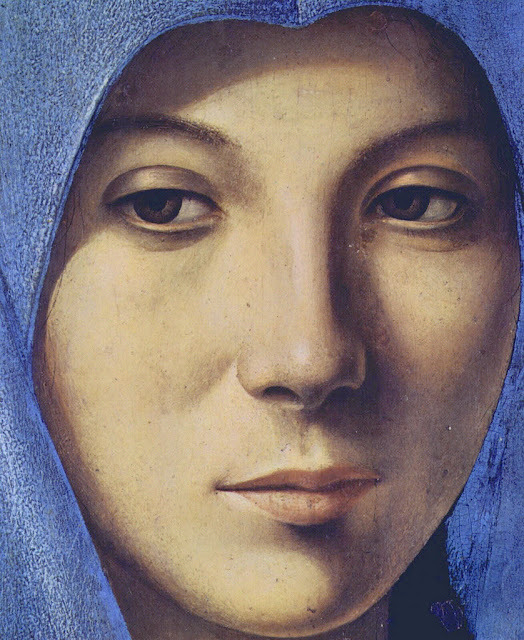 Mas ella, cuando le vio, se turbó por sus palabras, y pensaba qué salutación sería esta. 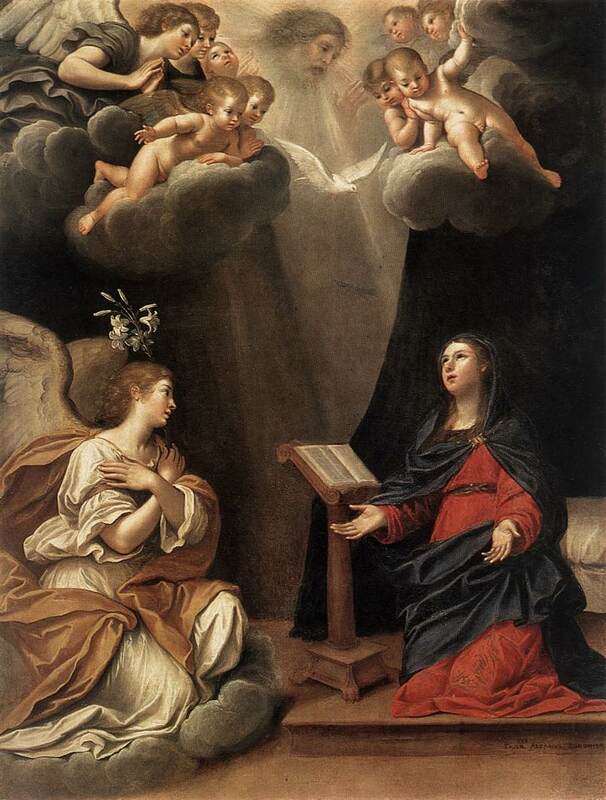 Entonces el ángel le dijo: "María, no temas, porque has hallado gracia delante de Dios. 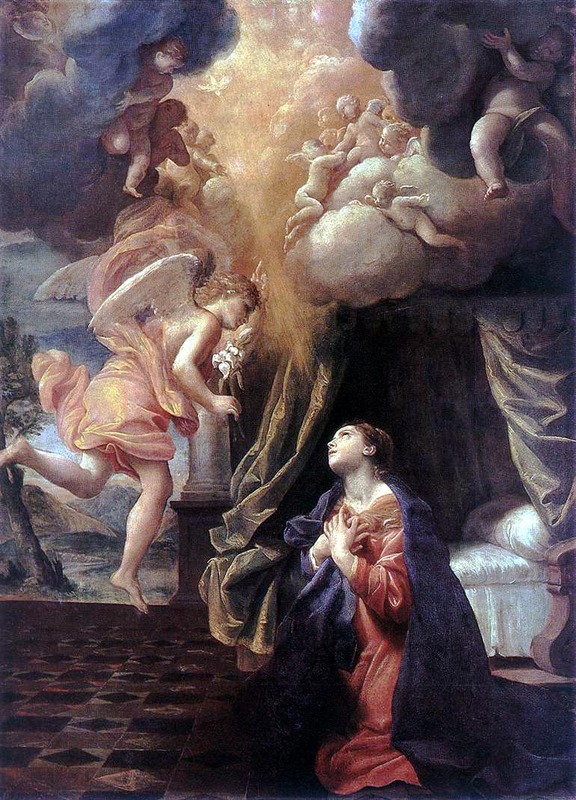 Y ahora, concebirás en tu vientre, y darás a luz un hijo, y llamarás su nombre JESÚS. 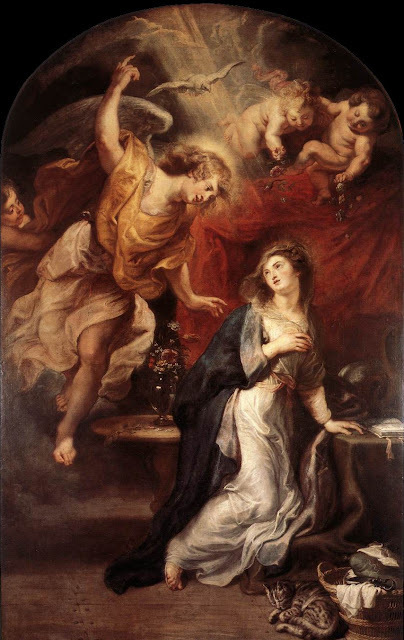 Este será grande, y será llamado Hijo del Altísimo; y el Señor Dios le dará el trono de David su padre; y reinará sobre la casa de Jacob para siempre, y su reino no tendrá fin". Entonces María dijo al ángel: "¿Cómo será esto? 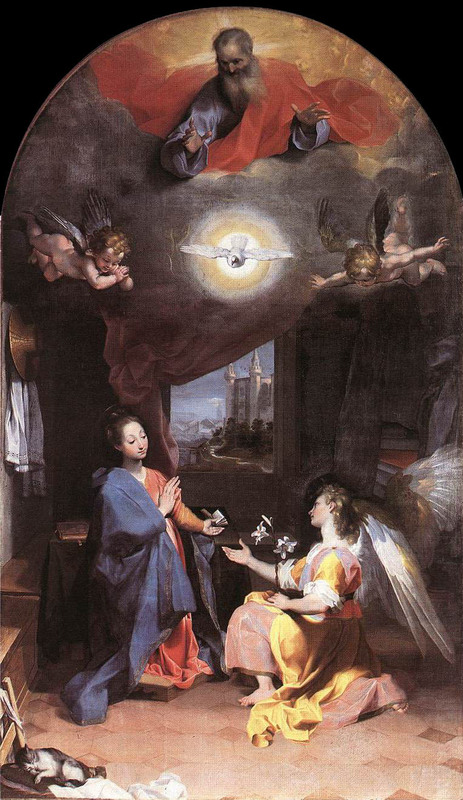 pues no conozco varón". 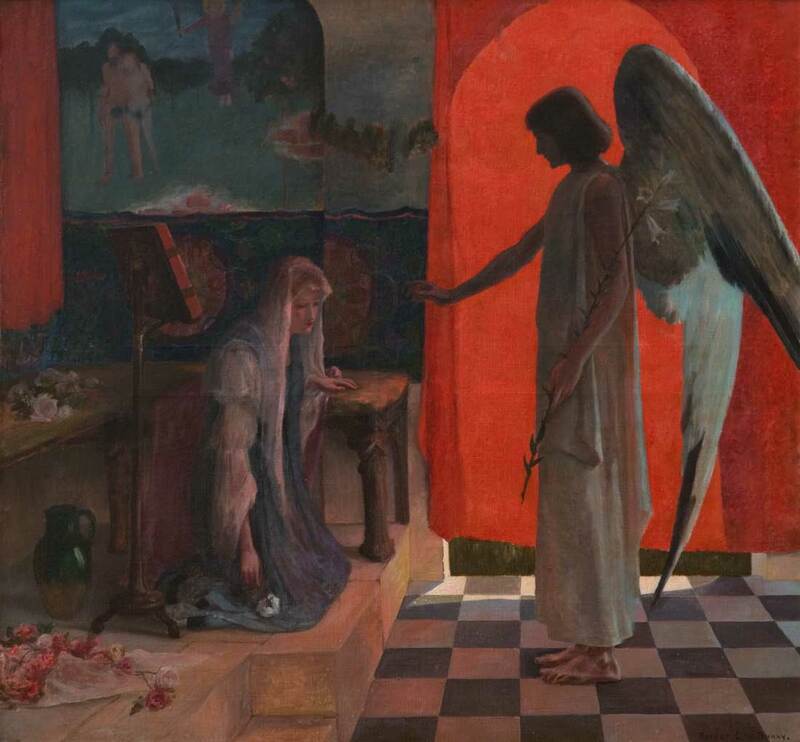 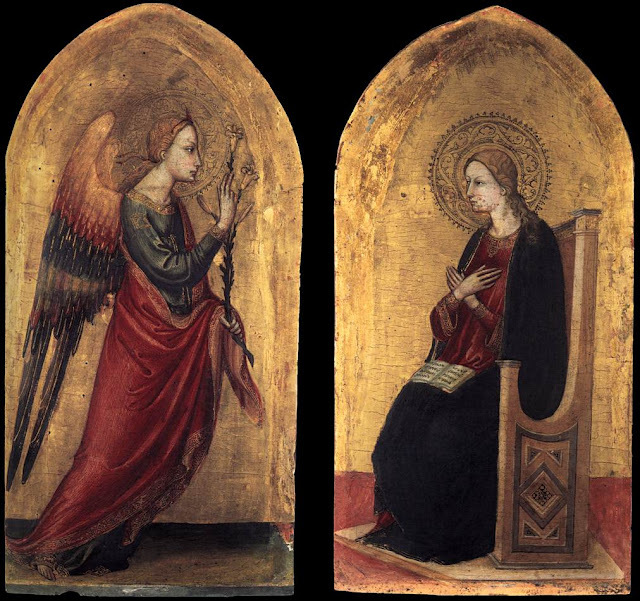 Respondiendo el ángel, le dijo: "El Espíritu Santo vendrá sobre ti, y el poder del Altísimo te cubrirá con su sombra; por lo cual también el Santo Ser que nacerá, será llamado Hijo de Dios. Y he aquí tu parienta Elisabet, ella también ha concebido hijo en su vejez; y este es el sexto mes para ella, la que llamaban estéril; porque nada hay imposible para Dios". Entonces María dijo: "He aquí la sierva del Señor; hágase conmigo conforme a tu palabra". Y el ángel se fue de su presencia. For it was now near three months since she was betrothed to him. At length it plainly appeared she was with child, and it could not be hid from Josep. 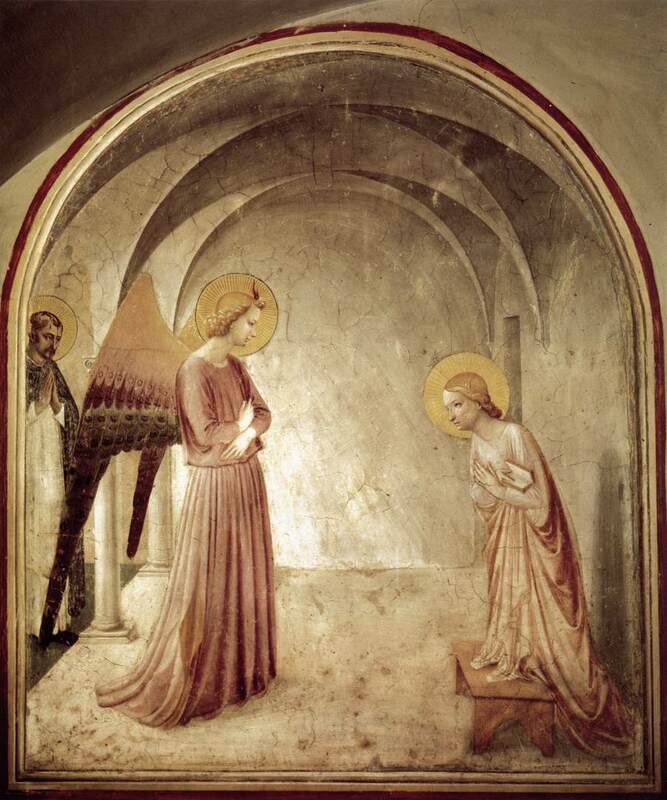 He purposed therefore privately to put an end to their agreement, and as privately to send her away. 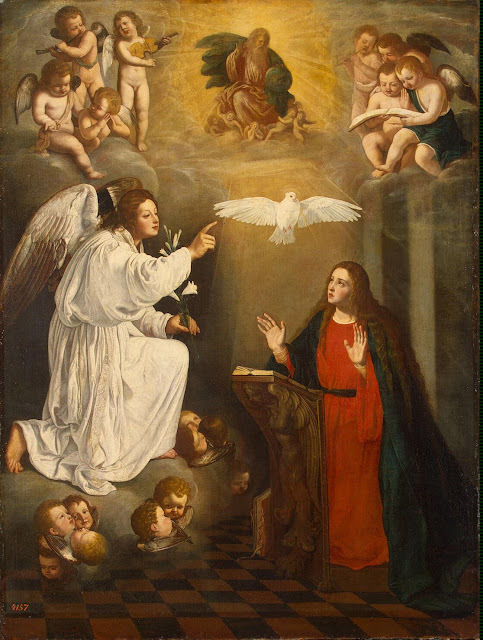 For that which is begotten in her and now distresses your mind, is not the work of man, but the Holy Ghost. For she of all women is that only Virgin who shall bring forth the Son of God, and you shall call his name Jesus, that is, Saviour: for he will save his people from their sins. 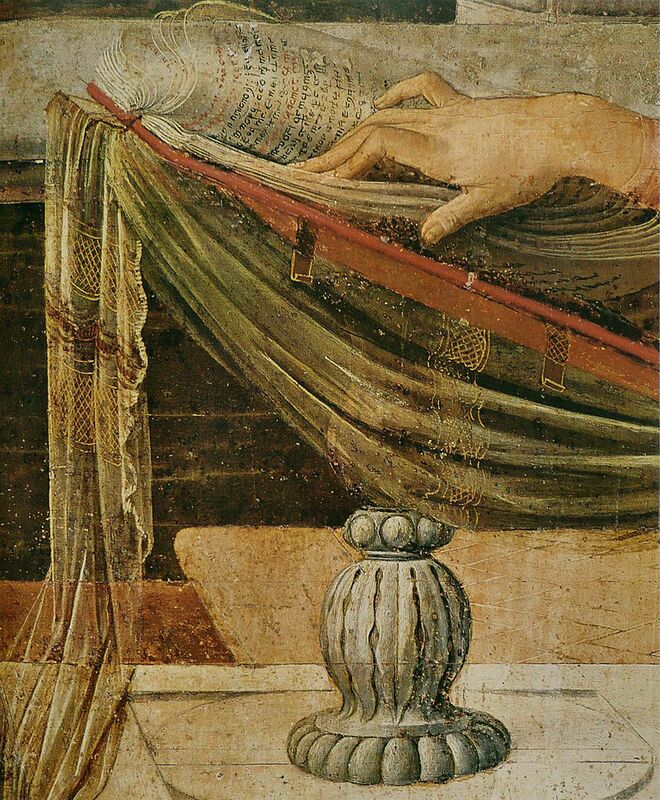 Joseph thereupon, according to the command of the angel, married the Virgin, and did not know her, but kept her in chastity. 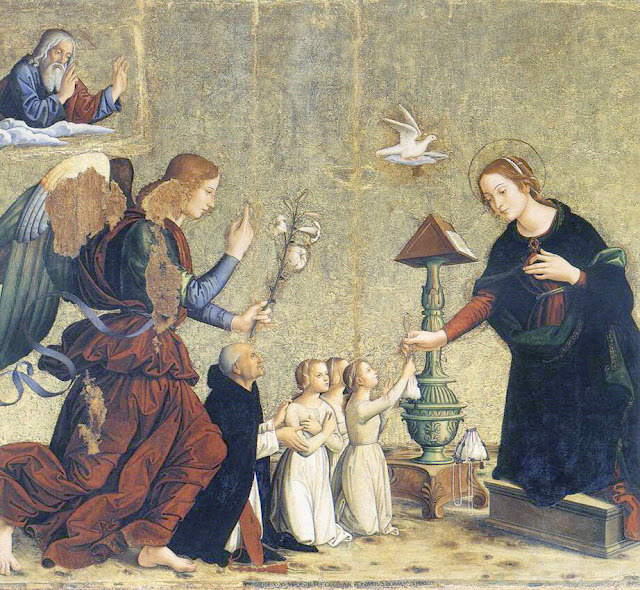 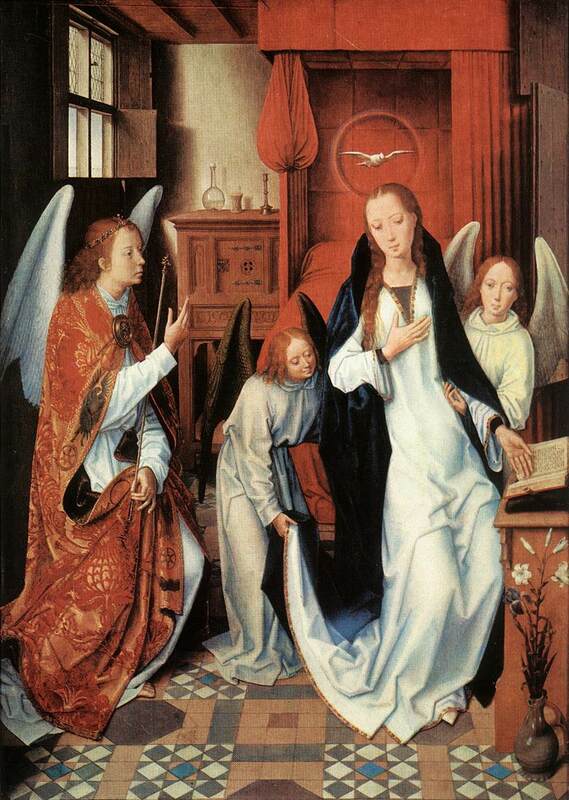 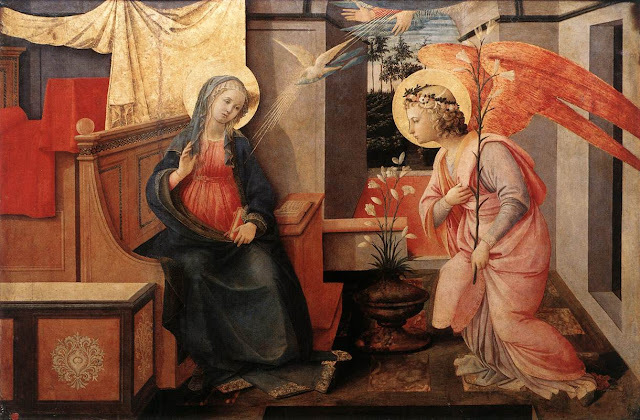 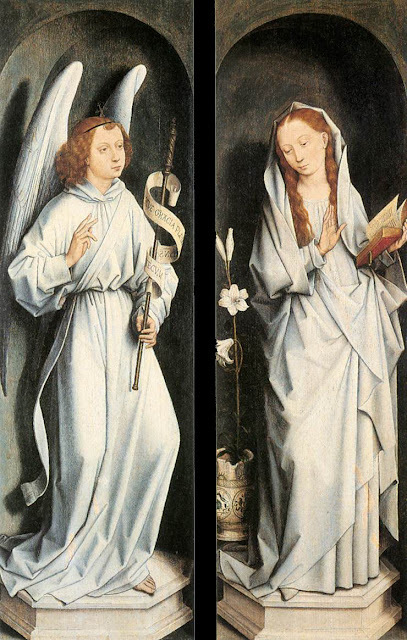 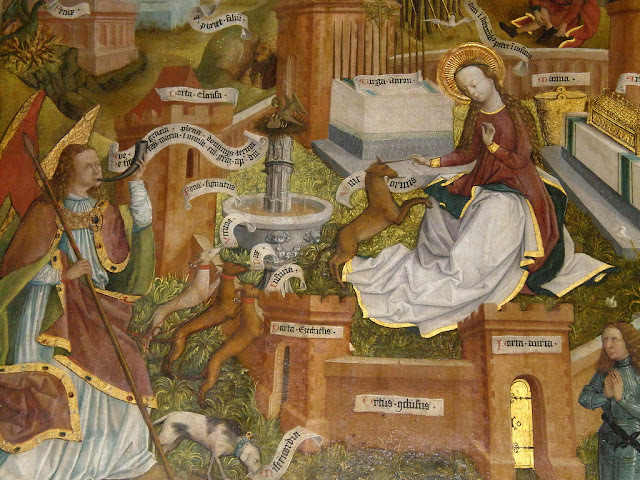 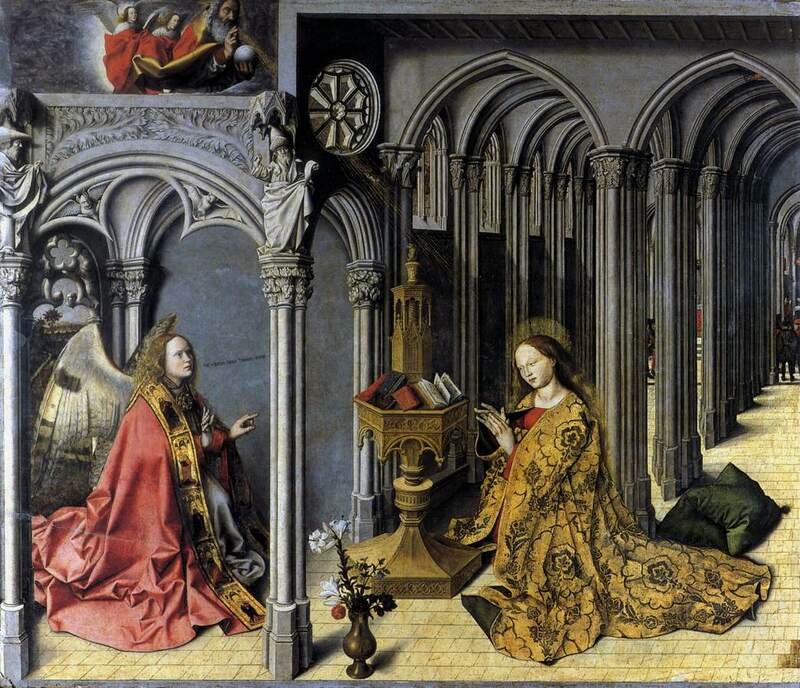 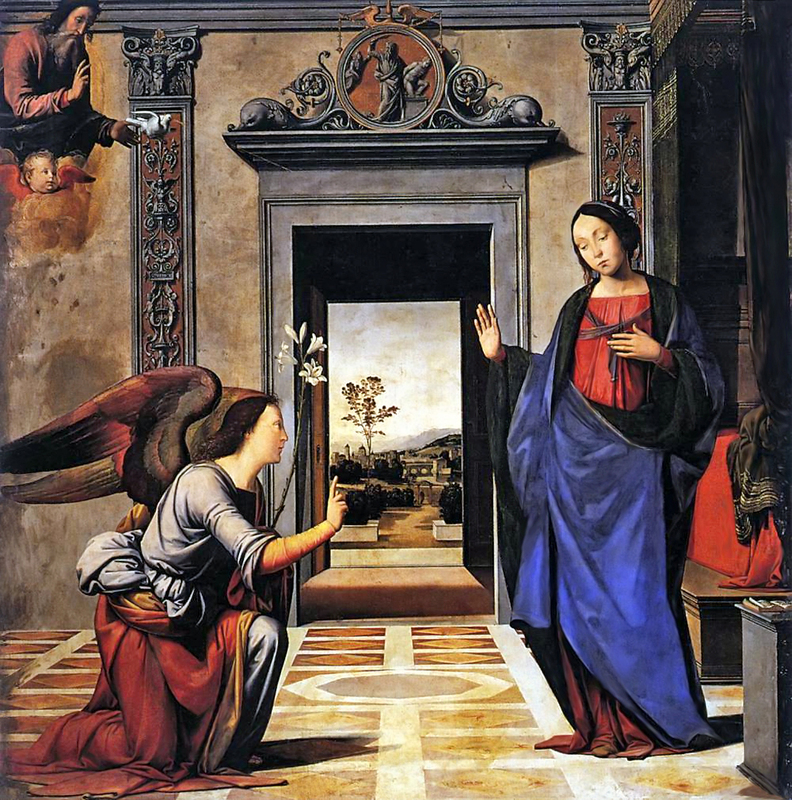 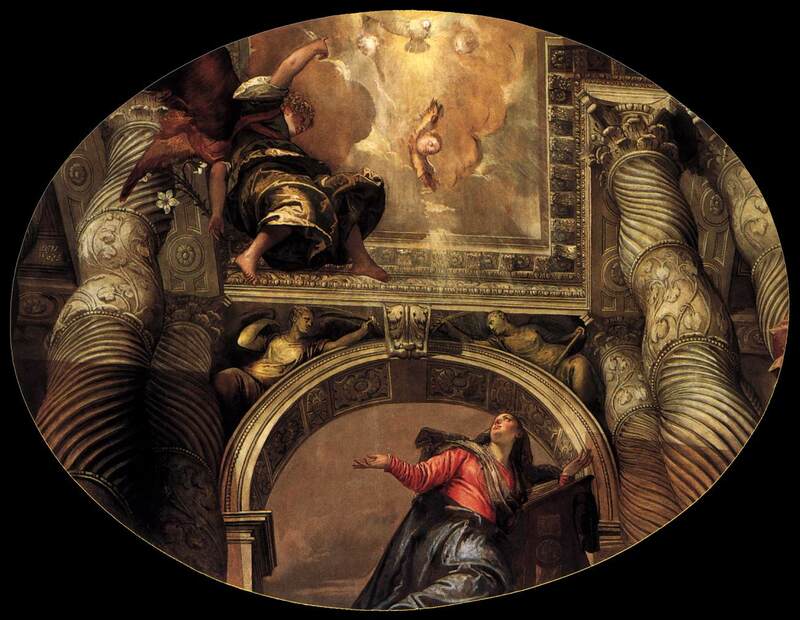 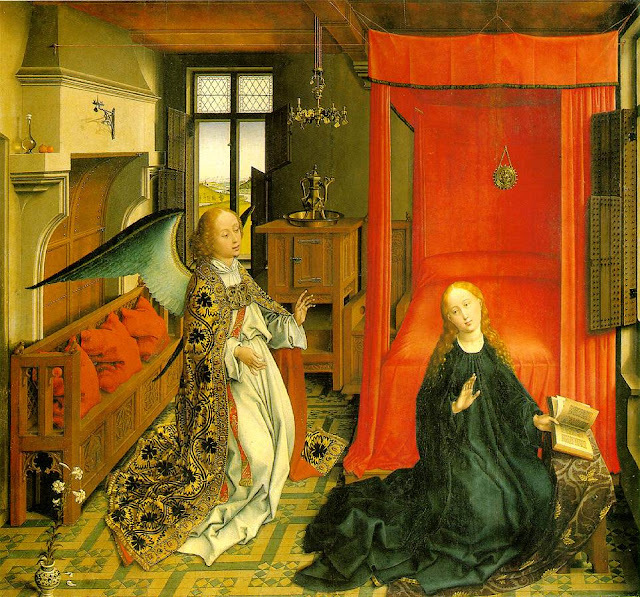 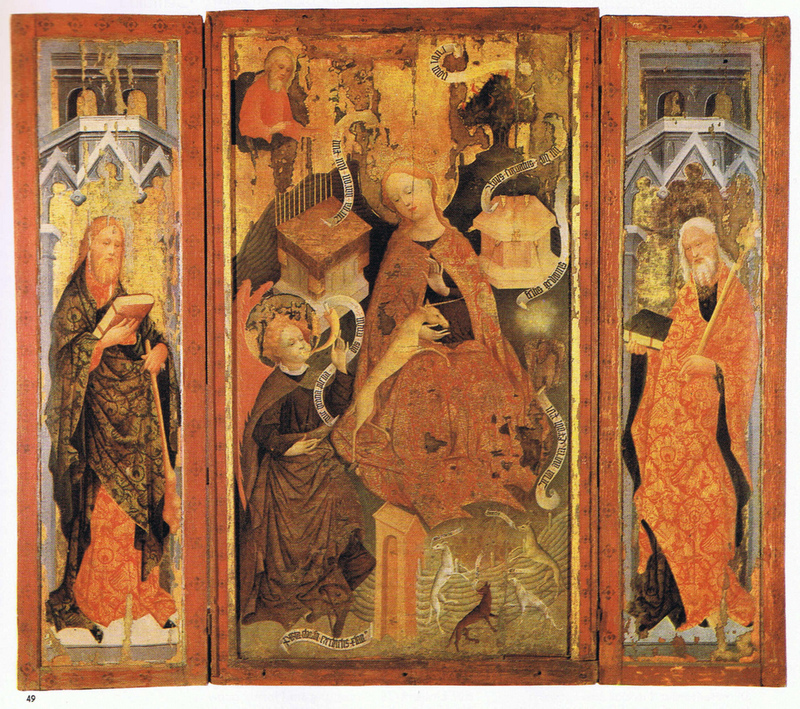 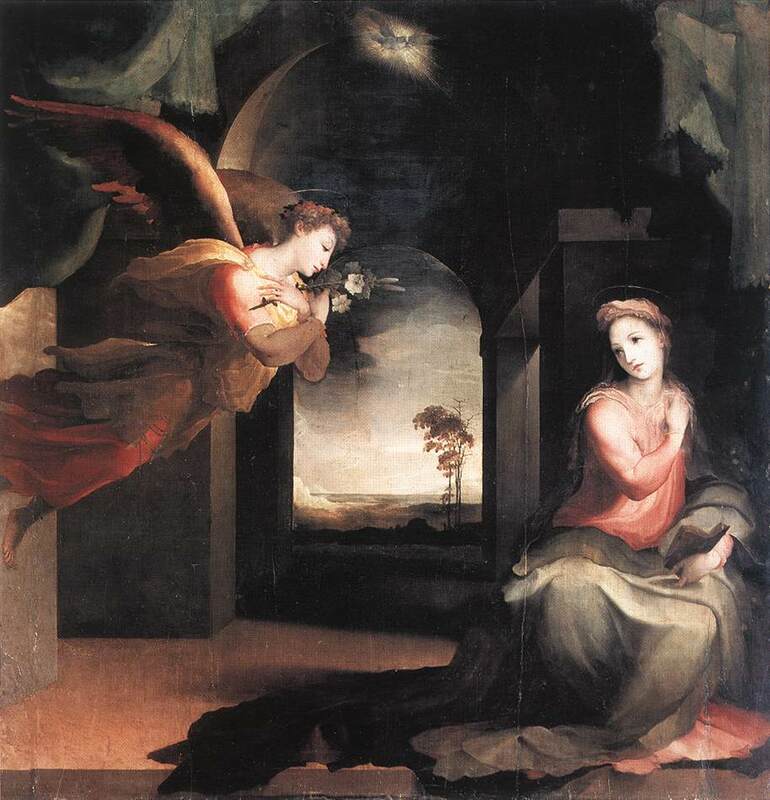 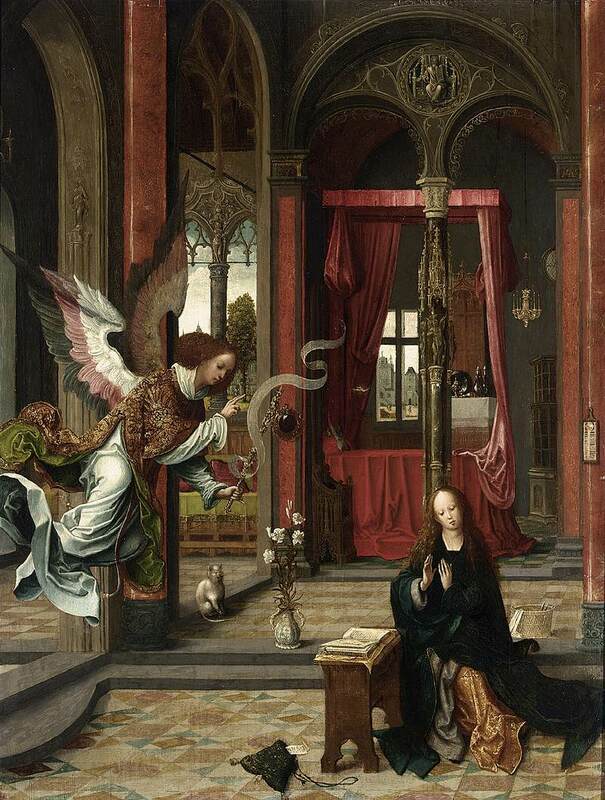 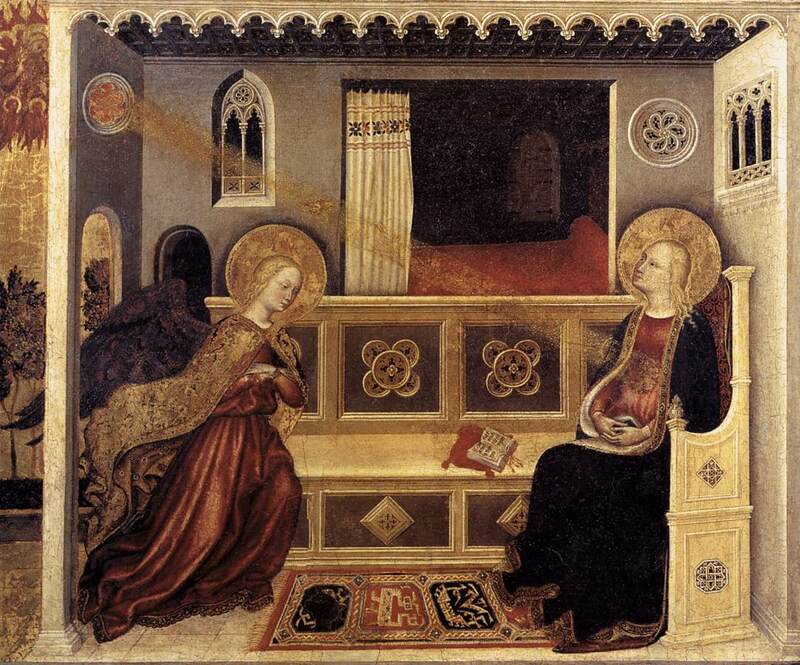 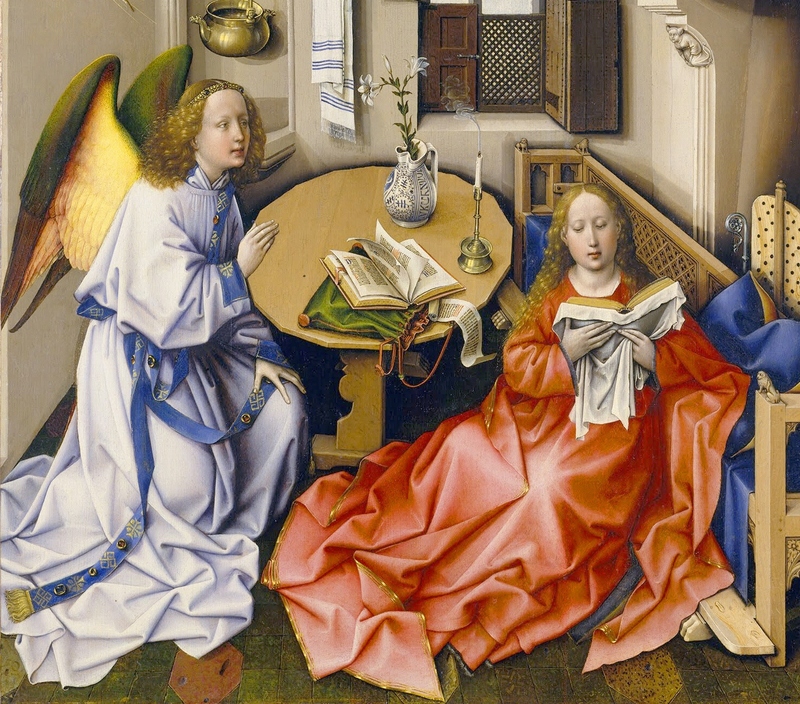 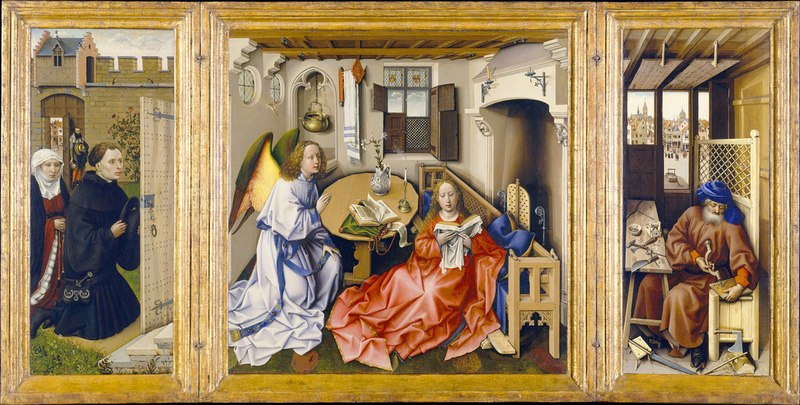 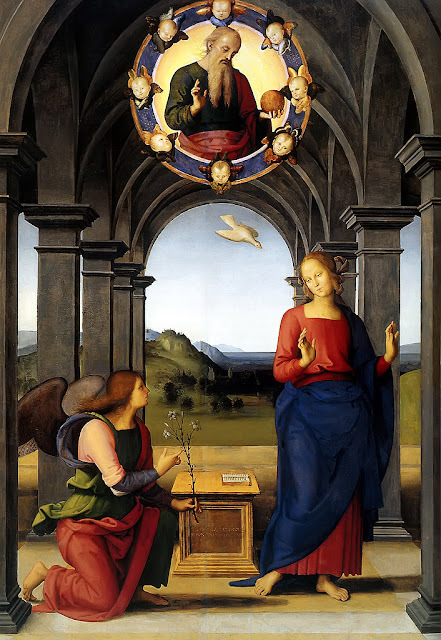 Annunciation - Jan de Beer - 16th c.